Las Vegas, April 26, 2017 – Semtech Corporation (Nasdaq: SMTC), a leading supplier of analog and mixed-signal semiconductors, and Ross Video, an innovative developer of high-quality equipment for the professional and broadcast video markets, announced Semtech’s high-performance UHD-SDI solutions are integrated with Ross’s video switching expertise to deliver a next-generation UHD-SDI switcher platform, the Carbonite Black Plus 12G Switcher. Based on the leading Carbonite mid-size production switcher, the Carbonite Black Plus 12G platform brings true UHD production into the mainstream. This version will accept both quad-link and single-link 12G inputs to provide connection flexibility for new UHD formats. In addition, the Carbonite Black Plus 12G features MiniMEs and MultiScreen processing and can be switched between HD and UHD operation. 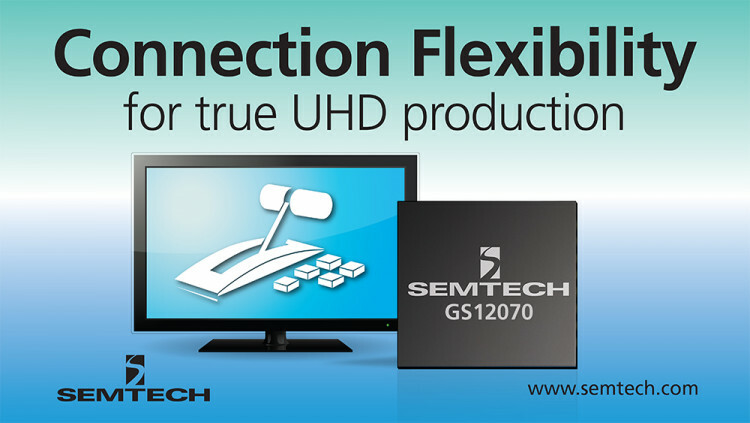 Semtech’s GS12070 UHD-SDI Gearbox has the configurability to perform both multiplexing and de-multiplexing between different UHD-SDI single- and multi-link interfaces. The device supports emerging 12Gbps and 6Gbps UHD-SDI interfaces as well as existing 3G-SDI and HD-SDI. The GS12070 allows the seamless integration of end-products using 12Gbps UHD-SDI for 4K UHDTV video applications into the pre-installed 3G-SDI based broadcast infrastructure. Single-link 12Gbps UHD-SDI to Quad-link 3G-SDI conversion, in both directions, is just one of the many features of the GS12070 UHD-SDI Gearbox. Semtech’s GS12141 UHD-SDI retiming cable equalizer and GS12181 UHD-SDI retiming cable driver feature low power consumption and provide industry-leading signal integrity performance at all SDI rates. Outstanding jitter cleaning, cable reach and unique eye-shaping enable reliable migration to 12G UHD-SDI for UHDTV interconnects. UHD-SDI is ideal for UHDTV infrastructures, including routers, cameras, monitors, switchers and more. To learn more about digital video solutions enabling the broadcast industry, visit Semtech’s broadcast video solutions. Passionate about live production, Ross Video designs, manufactures and delivers dependable technology and services that power exceptional live video productions seen by billions of viewers around the world every day. Relentlessly innovating, Ross Video delivers the world’s widest range of products and services for augmented reality and virtual sets, mobile live-event solutions, real-time motion graphics, robotic camera systems, social-media management, production switchers, routers, infrastructure products, video servers, newsroom systems, terminal equipment and more. All statements contained herein that are not statements of historical fact, including statements that use the words “to provide,” “designed to,” or other similar words or expressions, that describe Semtech Corporation’s or its management’s future plans, objectives or goals are “forward-looking statements” and are made pursuant to the Safe-Harbor provisions of the Private Securities Litigation Reform Act of 1995, as amended. Such forward-looking statements involve known and unknown risks, uncertainties and other factors that could cause the actual results of Semtech Corporation to be materially different from the historical results and/or from any future results or outcomes expressed or implied by such forward-looking statements. Such factors are further addressed in Semtech Corporation’s annual and quarterly reports, and in other documents or reports, filed with the Securities and Exchange Commission (www.sec.gov) including, without limitation, information under the captions “Management’s Discussion and Analysis of Financial Condition and Results of Operations” and “Risk Factors.” Semtech Corporation assumes no obligation to update any forward-looking statements in order to reflect events or circumstances that may arise after the date of this release, except as required by law. Semtech and the Semtech logo are registered trademarks or service marks of Semtech Corporation and/or its affiliates.